5. Eat Peking Duck – Yes! Yes! Yes! and Yes! Sometimes you have to take a pinch of salt to what you’re told in China, but I really do agree with point 5. You simply can’t come to Beijing without trying Peking Duck. I thought I’d had some of the best peking duck outside of Beijing, but I was wrong. There’s simply no other place around the world preparing this fine dish quite like they do here in Beijing. During this trip to Beijing I have just one mission, to find the perfect Peking Duck. The city of Beijing has a long and rich history that dates back over 3,000 years. Whilst the Peking Duck might not have as long a history as the city itself, the origins of this famous Northern Chinese cuisine still date back to the Ming Dynasty, about 600 years ago. The roast duck was skillfully crafted to perfection as part of the Imperial Court menu and was highly regarded by emperors and other members of the ruling classes. Once confined to the kitchens of the Imperial Palace, this highly-guarded secret recipe was later smuggled out of the kitchen and onto the streets of Beijing. Lucky for us, now we all get to try this legendary delicacy, which remains a famous dish among the locals and tourists. We based ourselves around the Old Beijing area and checked into The Emperor Hotel, which is only a stone’s throw over the 50-meter-wide moat and 10-meter-high defensive wall from the Forbidden City. The location makes a perfect base for exploring nearby tourist attractions, walking distance from Tiananmen Square, the Forbidden City, the last few remaining old Hutongs residential areas and also the Wangfujing shopping district. It’s a popular area for Expedia’s Aussie travellers, who usually spend 3-4 nights in the city. 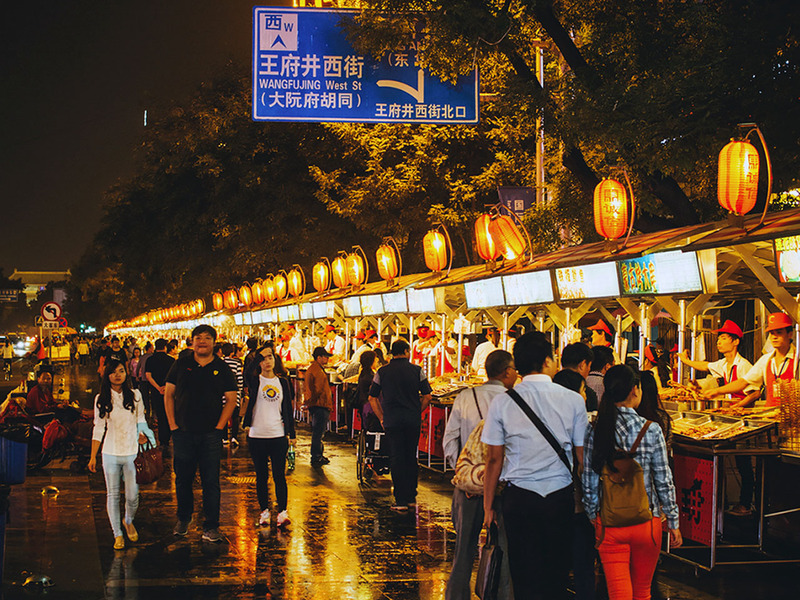 Apart from shopping, Wangfujing is also well known for the night market called Snack Street, where tourists get to try chewing on all kinds of creepy-crawly – usually as a dare. I pick up a skewer of two deep-fried baby scorpions, sprinkled with salt and chilli powder for 15RMB (AU2.80), and crunch away. It’s like a tiny prawn with a shell. Somehow I don’t think this exotic delicacy will make it onto the Imperial Court Menu anytime soon. Peking Duck is what we have our eyes on. Close by is Siji Minfu restaurant, where we get our first taste of the famous roast duck. 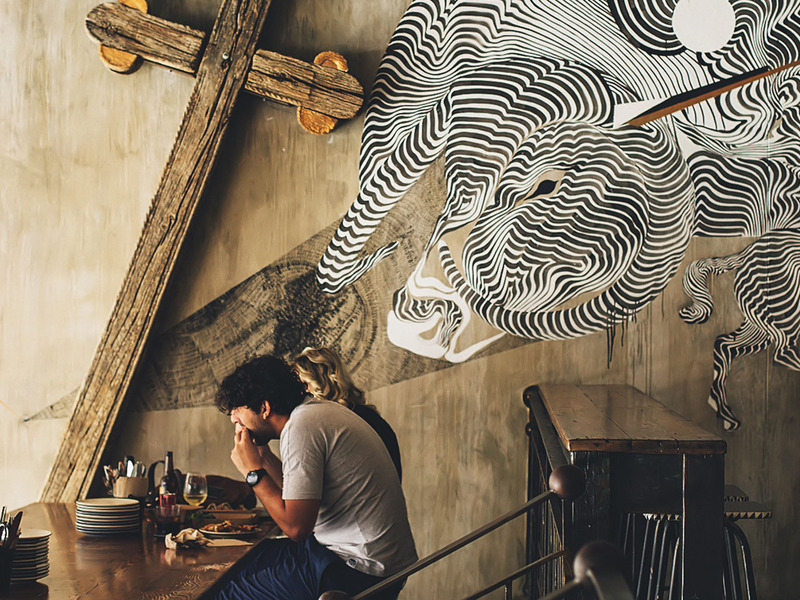 This restaurant prides itself on being MSG-free, with a few dishes focusing on organic produce. While most restaurants will only serve a full duck, here they offer half a duck for only 108RMB (full duck is 178RMB). Ordering Peking Duck is a theatrical experience. A roast duck is brought out and rested on a trestle table, then masterfully sliced by a chef right in front of us. We’re welcome to take the carcass home to gnaw on (late night snack? ), or leave it to the restaurant, where it will be used to prepare a duck soup for our second course. When it comes to eating Peking Duck, the process is just as elaborate. A waiter shows us the technique. She dips a piece of tender duck meat into the hoisin plum sauce then lays it flat on the top-half of a wafer-thin pancake; cucumber sticks and tendrils of shaved spring onion are added, a shield of glossy crispy duck skin rests on top without touching the sauce, keeping the crispness, before she folds the pancake up from both sides into a roll. There are wondrous textures and flavours in every mouthful, all the ingredients compliment each other harmoniously. Here at Siji Minfu, you also get an array of condiments to go with the duck, including garlic paste, plum jelly, ginger and pickles. But the traditional way is simply a sprinkle of white sugar on the duck, which helps elevate the flavour of the meat. We’ve had our first taste of Peking Duck and we want more! Quanjude Restaurant is world-famous for its roast duck, to a point where you can actually pick up one of their ducks at the local supermarkets in vacuum sealed pack that you take home and reheat in the oven. We’ll give that a miss. We follow the smell of roast duck and migrate to Sanlitun, an area crowded with high end shopping malls, trendy bars and fine dining restaurants and popular with expats. Here we find the most raved about Da Dong Roast Duck Restaurant, a massive site with a dramatic entrance. Think lotus ponds and a big white building that looks more like an embassy than a restaurant. The pictorial menu, as thick as an encyclopedia, is a marvel on its own. A whole roast duck here will set you back at 268RMB. The restaurant boasts their version of roast duck as ‘SuperLean’ – non-greasy, resulting in a better tasting. I couldn’t tell the difference to be honest. Having said that, it’s definitely one of the better Peking Ducks we’ve had in Beijing. If you love art and duck, then you will love 1949 – The Hidden City. The former Beijing Machinery and Electric Institute’s factory and research facility is a 6,000sqm complex that has been transformed into an entertainment hub of restaurants, bars, event spaces and art gallery. Here you’ll find Duck de Chine, one of the most upmarket roast duck restaurants and home to China’s first Bollinger Champagne Bar. Self-titled the most innovative duck restaurant, the restaurant brings together a classic traditional Chinese dish with a few unconventional, modern twists. The sauce here is exceptionally unique, it’s house-made and swirled with sesame paste and peanuts at the table before serving. Cantonese father-son chef duo Peter and Wilson Lam have formulated what they believe to be the perfect Peking Duck. The 43-day-old duck weighs approximately two kilograms, and is roasted for exactly 65 minutes over 40-year-old jujube wood. The succulent duck is indeed a little sweeter than most, with an earthy undertone that lingers in the palate. Sadly, we simply can’t forgive the thickness of the pancake, which is more like a blanket than a satin sheet.The staff are a little unenthusiastic too. We have stomach space for just one last Peking Duck and Jing Yaa Tang is our final pick. The restaurant is located inside The Opposite House, one the most prestigious hotels in Beijing. Although only opening a year ago, Jing Yaa Tang has already gained a reputation as a strong contender for “Beijing’s best roast duck”. Peking Duck is not just a dish, it’s a culinary art that takes years to master. We’ve been told there are only a handful of duck-roasting masters left in China and one of them is now taking the reign of the wood fired oven at Jing Yaa Tang. 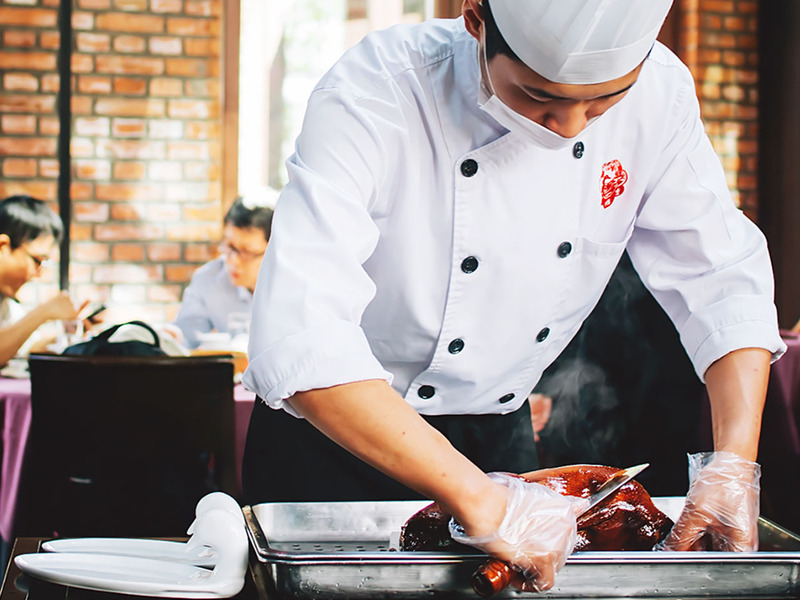 He has only one duty and nothing else – to roast the perfect Peking Duck. Every restaurant has its own way of preparing the perfect Peking Duck. Here at Jing Yaa Tang, the duck is poached in hot sugar water, air is pumped to separate the skin from its flesh, then the duck is hung to air dry in the cool room. The duck is transferred from the cool room while it’s still cold straight into the oven, which is one of the secret techniques. This way they retain the moisture of the duck. It’s roasted slowly in the oven fuelled by apple wood at a very low temperature. When it’s done, you’ll be rewarded with a plump, glossy Peking Duck with perfectly rendered, lacquered red skin and succulent tender sweet meat underneath. The longer roasting time in the oven lends a smokey flavour to the duck meat without overpowering. I’m definitely warming up to it. Jing Yaa Tang takes the gong for the most spectacular presentation of the Peking Duck. The chef carves the duck like a surgeon, each slice is exactly the same size and thickness. He then puts all the cuts back together on a plate in one piece, arranged like a heart-shape. It’s flawless. The condiments may not be as elaborate as other restaurants, but they’re definitely very proud of their house-made dipping sauce. I can’t say that I’ve found the perfect Peking Duck during my trip in China because there are still so many restaurants in Beijing to try. However, I can confidently say I’ve tasted some of the best Peking Ducks in my life, where else but Beijing.